Croatian Gymnasium Vukovar decided to take action against students´ negligence and carelessness when making their food choices. Students and teachers formed the school Eco Committee to change things in their own Gymnasium. The first important task was to investigate how serious food waste was at their school. Teachers posed some crucial questions to the students, but they did not expect the answers to be so terrifying. A compilation of student responses, the “Food Review” revealed that the most popular food among students was pizza, fast food, snacks and bakery products. These were typical food selections for lunch. Additionally, most students at the Gymnasium did not know how to cook other than heating food in the microwave. The Eco Committee’s discover indicated that there was a lot of work to be done. Its members started to inform other students on current food issues in order to create a dialogue. They explained them what is wrong, what is important, and how serious the impact of our food choices on natural environment is. Students could finally understand how food is connected to many problems in the world and how dangerous it is if we do not care. The Eco Committee then organized a workshop for the students and their parents to inform them about the “We Eat Responsibly” project and its goals. They explained them how to eat and behave responsibly and what they should change in their eating habits to reach these goals – and to help the planet we all live on. What is the best way how to inform young generation about current problems? What about a comic book? This interesting idea was realized by second and fourth-grade students who prepared their own comic book. They wanted to raise attention about students´ carelessness because the only possible outcome of such behavior would be catastrophic for our natural environment. Moreover, such catastrophe would be irreversible. The simple solution is that we should care and think more about our food choices and habits. In order to convey the urgency of the issue, students gave this book a relatively alarming title: “If only we cared on time”. The Comic book was written mainly for the younger generation, simply because the future is in their hands and literally on their plates. The Eco Committee simply wanted to explain to the students that there are many problems but we still have some time to change things, so we have to take action. 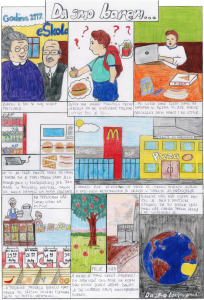 Vukovar students understood that lifestyle changes could lead to responsible consumption which consequently leads to sustainable life and healthier planet.